Mono Lake is a pretty famous location, and this scene has been photographed extensively. But I still wanted to capture it at least once just to enjoy and experience this majestic place. I ended up returning a few times. On this particular night, I drove out to the lake around 10pm or so and ended up staying until nearly 2am. Because of the famous nature of the lake and these limestone tufa formations, there were several photographers out there photographing in the dark on the shore of the lake. So I got caught up in conversation with a fellow landscape photographer late into the early hours of the morning as the moon rose over the landscape. The moon made capturing the stars difficult, but it also had the interesting effect of lighting the entire landscape like a sort of midnight sun, bathing it in a cool bluish light that brought out another side of the scene that you wouldn't see by the light of the sun. We both had a blast and it made for a memorable night under the moon and stars on the shore of this incredible lake, so I think it was worth doing. "I shiver, thinking how easy it is to be totally wrong about people - to see one tiny part of them and confuse it for the whole, to see the cause and think it's the effect or vice versa." One of my favorite things about the desert is its silence. There is a profound, all-encompassing silence in the desert that I don't find anywhere else. Sure, other natural wilderness places are quiet, but they usually have the sounds of the wind in the leaves, the singing of songbirds, the groans of tree trunks, the gurgling of brooks. The desert has silence. You can sit there at night and listen to what it must sound like to be deaf. There is a total absence of sound. In this silence, you can hear the desert speak, and you can hear the subtlest of thoughts and feelings within yourself. From that silence comes perspective and clarity. And that perspective keeps me coming back as much as the beauty and vastness of the landscape. This is another image from my day out trekking around the Anza-Borrego Desert State Park with Dustin LeFevre & Emily Dickey. It was great taking a couple of fellow landscape photographers to some of my favorite and most visited spots, and to watch them see things with their fresh eyes in these places that I've missed. There is an infinite amount of beauty and creative expression to be discovered and explored out there. We just have to put ourselves out there and find it. "The desert has its holiness of silence, the crowd its holiness of conversation." Wednesday, my alarm went off at 3:50am, and I quickly grabbed my gear and headed out the door to make the 2 hour drive out to Anza-Borrego Desert State Park. The day before, Dustin LeFevre and Emily Dickey, two landscape photographers I'd met online (Instagram rockstars, @dustinlefevre & @ienjoyhiking), had messaged me about meeting up for some photography in the desert. They flew in from Utah, and only had 2 days in California to work with. So we put together a list of places to explore and photograph. I met up with them at 6:20am at the spot where they'd camped for the night, on a jeep road that marks the beginning of a 4x4 route to a remote and relatively unphotographed Badlands overlook. We arrived at the badlands with just minutes to spare. As the sun crested the eastern horizon, there was a delay in the light, as a dense layer of fog in the distance over the Salton Sea caused it to form a big orange disc. Then, the sun rose from the fog and ignited the vast expanses of badlands in a vivid pink and orange glow that painted the hills in gorgeous light and color. (Those images are coming up next!) After the sunrise, we 4-wheeled our way back to the paved road, grabbed their rental SUV, and headed over to this slot canyon area, where they hopped into my 4x4 and we headed into the canyon wash systems, driving as far in as possible and then hiking the rest of the way on foot up the canyons. We spent the morning exploring 3 different slot canyons, and experienced some beautiful light. They soon had to leave for San Diego to catch their outbound flight back to Utah, so we ended the day early and I even made it home in time for lunch. What an incredible privilege and blessing it is to live in such close proximity to this desert wonderland! On our way out of the last canyon, we stopped and took turns taking photos of each other in the canyon to show some scale and to give you an idea of what it's like to walk through these halls of light and stone. Want to bring the serenity of the desert into your home? Beautiful framed traditional, aluminum and canvas fine art prints of the images in this post are available here. It should come as no surprise to you that the desert is one of my favorite environments to spend time in. It has also occurred to me that many people seem to view the desert as a barren, undesirable wasteland to be avoided or merely used as a metaphor for hard times in life or for existential struggle. They do not seem to see the intense beauty that is there all around, waiting to be noticed. If you are among these people, I would encourage you to spend some time in a desert with someone who does see its beauty. Then, return again on your own after you have been introduced, to listen and look. You may be surprised what you find. To me the call of the desert is a still-small voice in the wilderness. It can't be heard until you shut out the noise, silence your inner commentary, and turn off or leave behind the modern "conveniences" of smartphones and technology. If you sit in silence and see, the desert will call to you in a way no other place can. And once you've heard its call you won't ever be able to ignore it again. The West is rich with stories of people who left behind civilization to spend their days in the desert at a homestead, ranch, or mine. While many of them abused the land out of ignorance, greed, or mere necessity, many of them also had a fierce appreciation for the stark beauty and solace afforded by the desert. It created in them a desire to leave behind urban buzz & clatter and separate themselves to the desert so they could spend their lives listening to what the desert had to say. I know that while many of you may not be among those who have heard the call of the desert, for those of you who have, may these images be a postcard from home while you are sojourning in a faraway land. At nearly 10,000 ft. in the Eastern Sierra Nevada lies this beautiful little pond, resting along a gurgling creek meandering through the mountains. At peak autumn color, the pond is an absolutely sublime place to behold. Erica & I have made it a goal to visit this area each fall during peak color, and it never gets old – only more familiar. The Tuolumne River in Yosemite is a place that so many have an attraction to and fascination with, yet you don't truly understand why until you actually visit it. 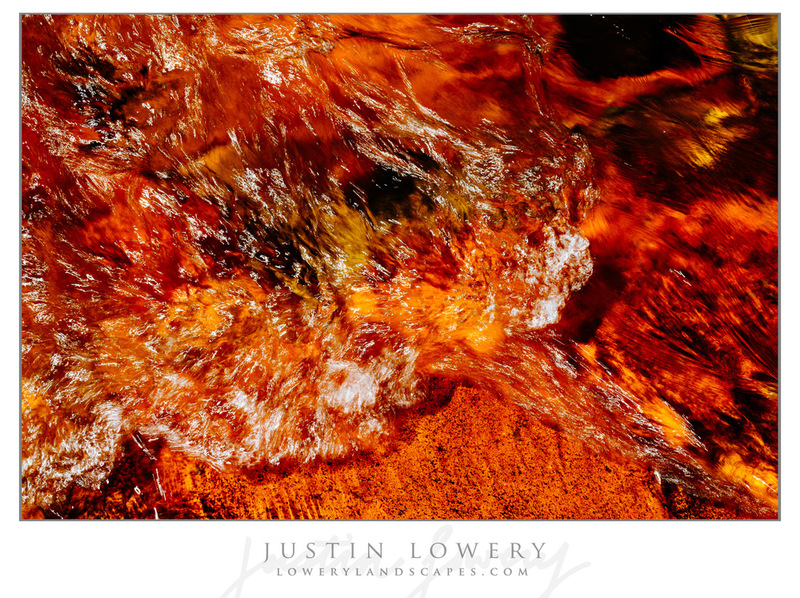 I spent the better part of an afternoon cooling off in the flowing water there after hiking Lembert Dome, and the way the sunlight, water, and red rocks on the river bottom interacted was at once beautiful, relaxing and captivating. I had the overpowering feeling that I did not wish to leave this special place. As we walked towards the exit of this beautiful canyon, I couldn't help but be drawn to the perfect warm reflected light that filled this section of the canyon. The footprints in the sand that the other hikers ahead of me had made on their way out led right around the bend and into the brilliant glowing sunlight. I feel this is an image about potential around the next bend in life's path, about hope in a dark place, about faithfully taking the next step around that bend and into your future. It takes faith, it takes hope, but it's always worth it. This lower image is not a crop of the above scene, but rather a 3-image panoramic merge of the scene to achieve much greater resolution and field of view. I love the level of detail in this one. A large grove of Joshua Trees in Joshua Tree National Park is backlit by the warm glow of the setting sun. This is an image from a day I spent in the park making photographs with David Muench. A very memorable day to say the least! It was a Friday afternoon at 4pm when I got a voicemail on my phone from Kevin at the Joshua Tree National Park Foundation. He said they had a last minute opening in a small workshop David Muench was holding in the park on Saturday, and that if I wanted the slot, it was mine. But I had to decide immediately. David Muench and Ansel Adams are essentially on the same level. They are both world-famous grandmasters of the craft of fine art landscape photography, and both will go down in history for changing the world through their work. So the chance to spend an entire day making images in the desert with one of my all-time heroes was something I'd be insane to pass up. David was the one who first popularized the near-far composition technique that we all know and use in landscape photography. Crazy! He has world-wide influence. He's even politically active in getting precious natural places preserved as National Parks and Monuments. Inspirational. So I jumped on it. After only 3 hours of sleep, I was driving the 2 hours out to the park, leaving by 3:30 am to meet up at the visitor center by 5:30 am in time for sunrise in the park. We spent the entire day alternating between exploring the desert looking for compositions, and breaks where we had open forums, image reviews, critiques, and classes. The best part of the day by far was the fact that several times throughout the day, I was able to talk one on one with David and swap adventure and photography stories, and talk about our favorite locations. A few of my images are my own re-imagined takes on images he made decades ago, and he was surprised that I had managed to find some of the more secluded and unknown locations. He was happy to know I hadn't shared directions to them with anyone! Before the end of the day, I was able to show him a bunch of my work, and get some pointed feedback. Amazingly, he really liked all the images, and only had extremely minor suggestions on processing tweaks with regards to evening out dodging and burning on a couple of images. The Anza-Borrego slot canyon images were the biggest hit by far. He liked them so much that he said about 6-8 times that I should really pursue solo exhibitions of the collection at some galleries and shows around Southern California, and also submit the images to several magazines, because to quote, "These are really original. No one else is doing this stuff!" He also signed two of his photo books that I have with personal notes on the title pages. He has been the principal photographer for over 50 of them, along with countless magazine covers and articles celebrating his work. All in all, a spectacular day, and the last minute opportunity was something that I was blessed with, and am super grateful to God for. Sometimes I like to go back through older image archives and look at them with fresh eyes. This one was a throw-away from a trip we took to Eagle Creek in Oregon's Columbia River Gorge in 2013. Looking at it a second time, I saw a really nice semi-abstract scene with great harmony and colors and decided to work with it. The very thing that draws me to these slot canyons over and over again is the light. The endless pools of reflected light, the warm orange and pink glows, the cool blue depths of the shadows, the rich textures in the stone – all of it. These things combine with the deep, sinuous depths of the canyons as they wind left and right, up and down through the earth's crust giving us a portal to another world. It's a world of silence, calm, peace and sanctity. It's a world that never changes on its own, and yet can do so suddenly when water and earth collide in a deluge of mud and water from a flash flood. This particular canyon is one of my favorites, as it is even deeper, darker, and more rich in texture and tone than some of the others I've spent time in. I love returning to this place, and hope to continue doing so again and again in the future. Each time I return, I get to know the place a little better. I see it a little more clearly, and get a feel for its character on a slightly deeper level. It's an ongoing relationship with meaningful places that tends to produce the best experiences, and as a result, the best images. This particular image is a vertical panorama of about 4-5 images made in horizontal orientation and combined to maximize field of view in the extremely narrow canyon. The entire canyon is only 3 feet wide in this section. This is one of the slot canyons in the Domelands section of the Coyote Mountains Wilderness Area near Anza-Borrego Desert State Park. On any visit to the wilderness, remember to be extremely respectful of the land, leave absolutely no trace, and pick up any litter you may find in order to leave this cherished place better than you found it so that both future generations and wildlife may continue to experience this delicate area as it was created. These baby Aspen trees have just taken root in the ashes of a grove of Jeffrey pines which had probably stood for hundreds of years but were killed along with millions of other trees in a very short time during a human-caused wildfire this past summer in the mountains of Southern California. These Aspens had grown back in just a matter of weeks. The Aspens are able to grow back so quickly because they never died. Aspen trees are like mushrooms, in that the entire grove of trees is actually one big super-organism that lives underground, and the trunks themselves are just the organism's way of getting the sunlight and air it needs. So when a wildfire destroys a grove of Aspens, it notices the absence of the trees and sends new ones up to replace them. On this day, I took the opportunity to visit one of the burn zones of one of our recent California wildfires. This one incinerated one of my favorite places for hiking and photography. To visit this place was to step into a dream, or a nightmare, like a post-apocalyptic movie. It felt like entering Chernobyl after the meltdown, or the site of a volcanic eruption. Every blade of grass, every tree, every piece of moss, every pine needle had been completely engulfed in flame and incinerated. All that remained was layers of ash and charred trunks of dead trees. In today's HD-3D-VR-faster-louder world, it seems that in order to be accepted – let alone liked – nature images must be cranked up to the max with strong contrast, vivid colors, epic skies, and shocking scenes. But sometimes the images that speak to us the most do so softly and clearly, in a still-small voice of sorts. The images I found here seem to do just that, and I think that's a good thing. Somehow I knew there had to be a great image lurking in the depths of that gorge. I could hear the waters rushing over the falls and down the gorge below as I hiked up the trail from Toketee Falls in Oregon. It was afternoon, and we'd just stopped there on our way to Crater Lake National Park from Portland after spending a week hiking in the nearby Columbia River Gorge National Scenic Area. All the other hikers passed right on by, but I decided to take a look. Jumping the guard fence, I found my self on the edge of a steep embankment that descended several feet to the edge of a 30 foot cliff that formed the edge of the gorge. Sliding down on my rear, I managed to make my way down to the edge of the drop very carefully. I'm not good with heights, so it was with much trepidation that I carefully lowered my center of gravity as much as possible, before delicately setting up my tripod in such a way that my camera would have a good vantage point overlooking the gorge. And the scene that greeted my lens is the one you see here. How do we make our photos survive? A discussion about legacy in photography. This is part 1 of a series. It began as a discussion on the merits of film vs. digital for capturing meaningful and lasting images, but ended up as a discussion on legacy in a digital age. I'd still like to address the other topic, so I'll have to do that in another post. As most modern photographers do, I create my work primarily with digital cameras. I struggle all the time with the feelings of inadequacy, the ephemeral nature of the digital images, the perceived lack of legacy, and the difficulty in making images that capture the "feel" or "look" of nature adequately. Today, I'd like to talk about the legacy problem. We are currently between a rock and a hard place in terms of image quality and legacy. Current-generation digital images will soon become obsolete and will not remain viable for future needs for very long. Film will soon become obsolete also, and increasingly difficult and expensive to obtain, print and develop. So where do we go from here? On the one hand, we have film. Film scanners are getting better all the time, while film remains more or less static (but very high) in quality. The film itself is getting more expensive, harder to develop, and more scarce in supply all the time. I guess what I'm trying to say is, while film is a workable solution for a very tiny percentage of photographers trying to create a legacy of images, digital is clearly the future and while film will probably not become extinct in the near future, it will become so difficult, expensive, and hard to find as to make working with it a non-viable option for the vast majority of photographers. Digital photography today is at a certain point of sufficiency, where we can make large prints from just about any of the current-day professional and prosumer digital camera bodies with a reasonable amount of detail. This is obviously a subjective point. If you are happy viewing your 40x60" print at arm's length, then the detail is impressive. If you want to shove your face into it or get out a magnifying glass, then you'll need many times the resolution that is currently available from mainstream digital sensors. We can't assume that our digital files will survive, be editable, and be printable in the future. A quick look through the anals of technological history reveals countless mediums, file formats, and devices that no longer function or that are inaccessible. Just try reading a 5.5" floppy disc on your MacBook Pro, or opening that Claris Works file you made back in school. What about the photos you made on an early 0.3MP digital camera? You probably can't get to those either, and if you can, you wouldn't want to do anything with those primitive and low-quality files. Photoshop, the world's dominant editing program, uses a proprietary file format owned by Adobe. Adobe can't even make up their own minds about how to make money off their software, and is constantly changing. Today, if you want to use Photoshop, you need a monthly subscription. It used to be version-by-version purchases. Now, the day you stop paying is the day you lose access to your images. I use layered, uncompressed TIFF files in Photoshop to help mitigate this somewhat, and export a clean un-watermarked JPEG file alongside for prints. All hard drives will fail eventually. Sometimes simultaneously and catastrophically. I personally lost over 1 million photographs to this several years ago when the simultaneous failure of two hard drives (primary and backup) resulted in a total loss of my entire image catalog. This was before online storage was affordable and available. But even today, you try uploading 2 or 3 terabytes worth of photos using most household internet connections! A recent study I read claims that statistically, within the next 10 years, over 90% of all digital photographs being made today will not be accessible. They will be gone forever. This hopefully will not affect photographers, who should make a concerted effort to protect their images. But most people do not understand the risks of the technology they are using well enough to prevent this loss. Facebook didn't exist 10 years ago, and they own Instagram and Facebook, the two largest repositories of today's "photographic legacies." The iPhone didn't exist then either. Today, the top 4 most popular cameras in the world (sorted by images uploaded) are all iPhone models. In another 10 years, who knows what technologies and networks will exist? We do know they won't likely be those of today. We also know that all those iPhone photos don't even look good today in print or on very high resolution displays at full size. And even if today's networks and devices do survive and by some miracle of technology, money, and corporate politics manage to preserve your images, the web and the world will look very different in another 10-20 years than they do today. If you are someone who cares about the images you are making, you need to be thinking today about where your images will be tomorrow. Before we dive into some potential solutions, there is one more thing we must look at. The ephemeral nature of social media, the web, and digital images actively works against the creation of legacy. Instagram and Facebook, along with Flickr, 500px, and Google+ to some extent, all are designed for images to be "consumed" by being viewed for a few seconds, a "like" or "comment" button tapped or clicked, and then promptly forgotten and hidden to make way for the endless deluge of mediocre content that all these sites are known for. If we want our images to mean something, to have a lasting impression on people, we need to get them into a format and place where they can last and be remembered for generations. And social media isn't it. I'm not saying to not share your work on social media, just not to depend on it to last. A good solution in this area for today is to own your own web presence. This generally implies having a website that you pay monthly or annually for (so it is not supported by advertising or controlled by corporate interests that do not align with your own). You should own your own domain name, and point people to that domain name whenever possible, rather than to your social media accounts. You should also print your work often and well. This legacy problem is twofold: digital and physical. Let's look at some solutions to each of these problems from some other photographers, who typically address them in tandem, since the master images and the prints often go hand in hand. We basically need to either print our images to a very high quality, or preserve them digitally in such a way that they'll be usable in the foreseeable future. Both camera sensors and display technology are increasing at an astounding rate, and within 5-10 years the images produced by most current digital cameras will be for most practical intents and purposes obsolete, which is to say they will look terrible on most digital displays which will exist to view them on. This is especially relevant when you consider that few people print their images, and the vast majority of photographs being made today will never be printed. Displays of the near future will demand ever-increasing amounts of detail, and our cameras today just aren't cutting it in terms of future-proofing. In order to maintain the relative resolution advantage that professional quality photography enjoys today, sensors will need to increase to a whopping 528MP resolution! Ironically, the only "sensor" capable of resolving that level of detail today is… an 8x10" film drum scan. So what is a photographer to do if they want to leave a legacy, but they simply do not have that $200 per image to shoot large format? The way I currently see it, there are a few options. Ben Horne and Alan Brock (as examples of large format film photographers who began on digital) have gone the large format film scanning route, producing files that can print to 40x50" at 300DPI. (See also Ben Horne's excellent YouTube channel here.) This solves the image quality problem, but not the cost or sustainability problems. This will eventually become a prohibitive solution. But for now, it works if you can afford it. It also transcends technology and its planned obsolescence by providing physical master files of the images that can be scanned with future technology to make prints using whatever print technology and mediums are the best available at the time of printing. Ming Thein has presented the "Ultraprint" solution, which is a digital process for producing 700DPI small prints, up to about 16x20" or thereabouts. In order to achieve this level of detail, he typically shoots with a Nikon D810 body at 36MP combined with excellent and very expensive Carl Zeiss lenses, and stitches multiple images together in panorama fashion (merging several vertical images to produce a single horizontal image at far higher resolution). This makes a great legacy format, because the prints themselves are made at 700DPI, which is so high that it could be scanned and re-printed, or enlarged – making a new physical master of sorts, which transcends technology and all of its inherent planned obsolescence. This is very labor intensive, but not prohibitively cost intensive. It will also get easier with time as sensors arrive which will no longer require stitching to achieve 700DPI prints at his print sizes. To date, we have accepted 300DPI as the "norm" for high quality photographic prints. So Ming's pioneering of a more than doubling of this resolution is commendable and very relevant. Guy Tal seems to have a third solution, or an anti-solution depending on how you look at it. And it is worth a look. (I can't recommend his book, More Than A Rock highly enough! It may just be the best book ever written on landscape photography. If you read one book on the subject, make it this one.) He is always something like a "zen monk" artist-philosopher of artistic nature photography, and I mean this in the highest praise possible. I look to him as an example in so many areas, and I feel he closely aligns in most areas with my own views on the subject. He says, if in doubt, do nothing. He chooses not to worry about his legacy, and feels that no one really controls their legacy in the end. So he just does the best he can with the best tools available for his purposes at the time, and lets fate take care of the rest. The irony of this position is that through his mindset, he has become a great philosopher, writer, artist and role model to other photographers. I feel his legacy will survive anyway because the texts of his writing are so easy and worthwhile to preserve, and the images he makes may just get to go along for the ride. C.J. Chilvers has a take on legacy as well, and his is twofold. First, he – like Guy – emphasizes the importance of emotional and spiritual meaning in your work. (His book, A Lesser Photographer, is recommended reading as well, and can be read in a single evening. Though I don't agree with him on everything, his book is very thought provoking.) I wholeheartedly agree with this emphasis on significance. Once the images are significant in themselves, people will do whatever it takes to preserve them. If an image has no deeper meaning than aesthetic attractiveness, no one will care about the image enough to preserve it. In the end he, like Guy, says to forget about legacy. Once you have a collection of worthwhile, significant and meaningful images, C.J. makes the case for preserving them in books. (He also references Garrick Van Buren's excellent piece, "If You Wanted to Ensure it Lasted 150 Years, You'd Choose Paper".) He regularly makes high quality printed photo books of his images, and distributes them to friends and family. This ensures the images are at least semi-regularly appreciated, and that they survive him and live on to be enjoyed by the next generation. This also helps to transcend technological limitations, in that the books become timeless heirlooms that exist in their own right, independent of the technology or corporate infrastructure that enabled their creation. If you've made it this far, thanks for reading my rambling and somewhat in-cohesive thoughts. I'm still finding my voice as a writer, but I do know that I must do so as without words my images will not carry as much weight as they could. This is not intended as an opinion piece so much as an open discussion of some of the struggles we face today as people capturing photographs of the things that matter to us. I don't expect anyone to agree entirely with these thoughts, as I sometimes don't know if I agree with them myself! I do know that I want my images to last, and that right now I'm not confident they will. So I'm putting this out there as a way to get us to think about these issues and how we can begin to solve them. • Print your work regularly and well, even if you aren't a "real" photographer. • Focus more on human emotion, spiritual significance and lasting meaning than on technology. • Don't rely on social media for your legacy. Own your online presence. • Focus on getting your images in front of people who genuinely care about them and you. If you enjoyed this piece, please share it with those who will care, and subscribe / follow using the links below and in the sidebar. Merry Christmas from snowy southern California! This is an image I made back in 2013 while hiking up the 11,500 ft. San Gorgonio Mountain during a blizzard. It's one of Erica's favorite images, and I felt an appropriate one to share on Christmas day. "and may all your Christmases be white…"
On the 24 day trip through the Pacific Northwest that Erica and I made this summer, we explored a ton of waterfalls. This one is a smaller waterfall just a bit downstream from Gorton Creek Falls. Emerald Falls has been messed up a bit by the diversion of water in the past, and there is as usual still destructive evidence of the apparatus of man's shortsighted toiling with nature in the form of rusted pipes and water diversion apparatus in the area. However, the waterfall itself is still immensely beautiful and elegant, and I had the whole place to myself the entire time I was there. I put a lot of work into this image, to ensure it holds an immense amount of rich detail and well balanced tones. If you are looking at this on your phone or other small screen (as stats tell me 30% of you are! ), please realize that you are seeing a tiny, dim, compressed, and generally dramatically under-represented version of the image. For a better idea of what this image holds, I encourage you to take the time to view it and the others at home on a nice big display, such as a desktop computer or even an HDTV. I created it to be printed large, and at 40x60" on metal, the leaf in the foreground would be the size of your outstretched hand, and you'd be able to count the blades of grass and the leaflets of the ferns. The waterfall would glow and practically gush out of the image, giving it an almost 3D appearance. The images I create are intended to become heirloom art pieces, not Internet posts that are forgotten in minutes. I post them on social media to get them out there and in front of you in the hope that you'll be curious to see them at their best, and of course to brighten up your feed in a small way! Since you are seeing these images on my website, you are getting a better experience than most online, but still nowhere near the experience of a print. If you are someone who makes images that really mean something to you, as most of us are, be sure to take the time and money to print your images from time to time. It'll create a much more meaningful legacy and experience of your images than sharing them digitally can ever hope to accomplish. Both books and prints are excellent for accomplishing this goal, and you'll be surprised just how enjoyable the experience of holding or viewing high quality physical prints of your most loved images can be! The sandstone in this narrow slot canyon in California is painted in varying hues of orange and purple like a royal tapestry curtain hanging from a large, timeless window. The soft focus on the sides guides the eye forwards and inwards, giving you the feeling of walking through the narrow, sinuous halls of the canyon, enveloped in warm and colorful hues of richly textured sandstone. The slot canyons here in California are numerous, diverse, unique and gorgeous. Yet they are virtually unknown to most people who focus almost entirely on those found in Utah and Arizona. I have had the incredibly great blessing of being able to live relatively close to the desert, so I've spent the better part of the last 4 years' worth of weekend trips during the cooler months out exploring the Colorado & Mojave Desert regions and finding many new slot canyons to explore and photograph. They have become something of a passion and speciality for me, which is why you see so many of them on my feeds and website. This image was named after the song of the same name, which sings of God's love as a "Tapestry of Grace" that we are wrapped up in. This Christmas, I like to remember what this incredibly joyous holiday is all about – God's immense and indescribable love in sending his son Jesus to redeem us from our sins and give us hope, love and a future home in Heaven. All we must do is use our faith to believe. We are saved only by His grace. With Star Wars The Force Awakens coming out this week, here's an appropriately themed image. Of course, I've been working on this one for a while, so no, it's not merely for the movie! But ironically, this very forest is where Endor was filmed for Return of the Jedi, and I hadn't processed any images of this scene. It is the same area where my "Tree of Souls" image was made, though that one was inside of a tree, so you couldn't really get a sense of the scene. And oh, what a scene it was! What an ethereal, surreal and moody place to visit. The trails wandered through the massive redwood trees, which were 10-15 feet in diameter and hundreds of feet tall, and truly made you feel utterly minute and insignificant in the face of this vast and powerful landscape. This is another image from our 24-day west coast and pacific northwest road trip this summer. On days 2-3, we stayed near the Redwoods, and I was able to experience hiking through the Redwood forests for the first time. It was definitely one of the best hiking experiences of my life to date, and I've had quite a few epic ones! "Tree of Souls" was also made here on the same day, and you can see it below. It gives an unusual view into the inside of one of these magnificent trees, while "Endor" is about the entire atmosphere of the scene in that special place. Sunrise in Death Valley is one of my favorite experiences. This is one of many images I made during a particularly cinematic sunrise this past spring. The way the sun paints the fresh dunes in golden light after a windy night erases all the footprints from the day before is the quintessential symbol of the dawning of a new day, ripe with opportunities. The night before, I'd arrived in the park just after sunset and set up camp alone in the desert beneath the banner of vivid stars overhead, as a warm spring breeze wafted scents of desert air through my campsite. I awoke early in the predawn light and was on my way to the dunes within 5 minutes. Arriving in plenty of time for sunrise, I hiked out across the sand and set up my tripod in the spot I'd scouted the the night before. Then I waited for the show to begin. I struggle to portray these places in a way that I'm satisfied with. This is the second try at this same spot, and I feel I did a somewhat better job the second time around, but still there is far more potential there than is realized here. The way the sandstone in this spot rolls over you like a massive barrel wave, frozen in time like a fossil is amazing to me. It envelopes you in the very fibers of the earth in a way only slot canyons can. I do realize that there are many who do not appreciate the desert the way I do, and there are others who appreciate it even more. I do wish I could open the eyes of those who do not see its beauty, but rather prefer to look at it as merely a desolate wasteland to be exploited by energy development and mining companies. These places are chocked to the brim with creatures specifically designed to their very core to dwell in it, creatures that could not live anywhere else. It is filled with life, and not only life, but life that tells story after story about resilience and fortitude, about harmony with one's environment, about seeing the light in the shadows. It never ceases to amaze me when I top out on the brim of a canyon after a hike of many miles up harsh and eroded washes, only to find a tiny lizard barely the size of my little finger has found a home for itself and is raising offspring and foraging for food and water up on the exposed and narrow spine of one of the canyon rims. If life can not only survive in these hottest and driest of places, but vibrantly thrive, what excuse have we in our extreme convenience and abundance? Today, I embarked on an adventure with a group of hikers and explorers, and we spent the day exploring miles of slot canyons, many of which were new to me, and most of which were unnamed and relatively or completely un-photographed. All this in places most Californians are unaware exist at all, much less in their own state, even less their own county! We were joking about how we could all go back home and when friends asked us what we did over the weekend, we'd say, "Oh, a bunch of Indiana Jones type stuff, you know…" To which they would respond, "Haha yeah right, that boring, eh?" Well, here's a small bit of proof for the doubters! Haha. The more we explored, the more slot canyons we found. We soon felt as though we were in the midst of a massive living organism, the arteries and veins of which were the slot canyons. In a way, that's a good metaphor. Slot canyons exist in the desert, and are entirely formed by rain - the fewer than 5 inches of rain that falls in an average year. These rains feed an entire desert ecosystem, much of which depends on those rains for opportunities for resupply or reproduction. Often, it is not the average rain that creates them, but rather one massive deluge from a thunderstorm lasting mere minutes which creates the powerful and violent flash floods which rage through these arteries in the rock, filling them with water, rock, and mud in seconds. If you've ever seen a video of a mudslide, you can get a small idea of the sheer power of these flash floods. Often after a single flash flood, a canyon may be scarcely recognizable in places because of the transformation. The flood will raise or lower the floor of the canyon, change the shape of the walls, move boulders around, and more. All in just minutes. Perhaps most incredible, however, was not the canyons at all, but the strata they were formed inside of. The entire area was composed of wildly varied layers of conglomerate, sandstone and mudstone, which were layered in strata with layers of stone pebbles embedded in them arranged vertically or on various steep angles of say 45-80 degrees! Further, the layers were curved or wavy. Now, gravity only goes one way, straight down. So you need to realize what this implies: that this entire area was soft mud, all at the same time, at one point in time, and then that mud was violently pressurized, forcing it into these shapes, before the waters receded and they dried, forming the stone we see today. Only then could the flash floods even begin their work crafting these masterpieces. The light that fills these canyons makes them incredibly varied and beautiful to behold. The key to the colors is very simply reflected light. The sun shines directly on upper and exposed areas of the canyon, which then reflect that light in a bright golden color into the shaded areas. Each time the light bounces off a canyon wall, a portion of the color spectrum is lost, which has the effect of making each opposing wall reflect a different hue, with the walls working their way through the color spectrum from warm oranges to cold blues. The human eye can see at least a portion of this effect, which makes a walk through these canyons in good light a thing of beauty to behold. Usually, most people don't take the time to allow their eyes to adjust to the light and really be mindful and present to observe the colors, so they miss out. This is why it is important not to rush through but to take your time and really be observant and in the moment, rather than rushing to much to see what is around the next bend. Modern cameras really excel at capturing these color subtleties. However, you might not realize this because they generally try to "compensate" for the "too warm" or "too cold" colors, by automatically adjusting their white balance to cancel out the effect in an effort to maintain color neutrality. Further, they are programmed to expose the scene to an average value of 18%. This is great for creating a balanced exposure, but it all but ensures that the contrast of the scene will not be ideal. With bad contrast, the human eye is unable to correctly judge colors, which makes for a bad image and viewing experience. So as part of my post-capture workflow, I manually adjust the color spectrum and black and white points to bring out the best of the color spectrum and contrast that was present there and accentuate it in a way that the human eye can easily appreciate. This also gives me an opportunity to bring my artistic vision to the scene so that I as an artist can show you what I visualized in the field. My goal is rarely (if ever) to bring you a robotic representational image that is enslaved to some Japanese engineer or programmer's (the people who made the camera) algorithmic interpretation of reality, but rather to bring to life a pre-visualized work of art that conveys what I felt there in that moment. I feel that it is extremely important to differentiate between representational photography and fine art photography, as the two are to photography as objective journalism and subjective fantasy novels are to writing. Each has its place, but while one is limited to the conveyance of literal facts, the other allows us to bring our creativity and humanity to bear in order to show others a world as we envision it in our mind's eye. This is the role of art in photography. It is through art that photography can transcend its limited existence as a technical capture medium, and ascend to a higher one as a medium of creative expression. When photographers say things like, "I am just in the right place at the right time," or "I'm just operating the camera, nature or fate makes the scene," they mislead viewers and do humanity a disservice by eliminating artistic interpretation and creative vision – the vital human elements – from the equation. If a drone could have been programmed to make the image, why was a human needed at all? Humans bring creativity and imagination to the table, and those very things make the image and give it emotional meaning and relevance. As a result, the fine art world often fails to take photography seriously as an art medium, and who can blame them when we have a lot of self-professing robotic machinery operators producing and selling images, and placing emphasis on automated technology rather than inspired artistry? An artist with a camera can and should use it in much the same way a illustrator uses a pen or a painter uses a brush, and should not be ashamed to do so. This is the role of humanity in photography.